With a ten year trajectory in the Panamanian market, Hospital Punta Pacifica offers health services at a private level, supported by leading-edge technology and high human quality that guarantees the fast evolution and speedy recovery of its patients. Located in a very important zone of Panama City and surrounded by well-known hotels, shopping centers and office towers, Hospital Punta Pacifica takes care of patients from any part of Panama and the world that want to receive a safe, comfortable and quality service. Its comfortable facilities, modern equipment and highly qualified staff allow it to offer a wide range of medical services for assessments and care, such as operating room, emergency unit, intensive and semi-intensive care, laboratory, radiology, pharmacy and hospitalization wards with private, suites and presidential rooms, specially designed to be cozy and allowing the hospital experience to be as comforting as possible. The physician and health staff is updated with the latest advances, since it has a continuous education program where important topics are shared every month, through real time videoconferences and update symposiums in different medical fields. 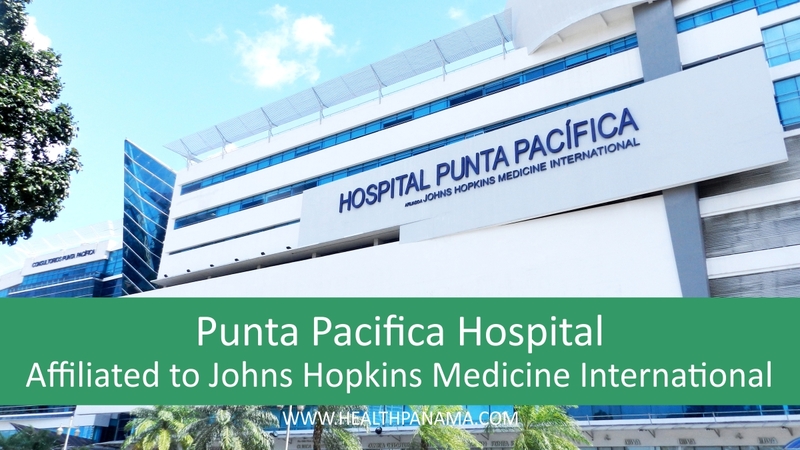 With the courage to be forefront with the worldwide leaders in hospital care, Hospital Punta Pacifica has gotten affiliated with important international institutions, such as Johns Hopkins Medicine International. This affiliation represents having constant advisory about its operations, including: collaboration in the development of medical programs, patient safety and quality improvement initiatives, as well as physician, nursing and administrative training. During these 10 years of operations, it has obtained certifications like ISO 9001-2008 for its Clinical Laboratory and the accreditation by Joint Commission International, due to its distinguished management and high standards, being the first hospital in Panama to become accredited, showing a firm responsibility to offer a safe health care. Since the beginnings, Hospital Punta Pacifica has committed itself to offer care to people with the highest quality, safety and technology standards. Because of this commitment and the distinguished team of professionals, Hospital Punta Pacifica has received many acknowledgements along its path, like being named the best hospital in Panama and the second best in Central America, according to the “America Economia 2015” magazine. What began as a consultancy, after hard working and productive work meetings, became a prosperous affiliation with Johns Hopkins Medicine International, a worldwide and well-known institution in different medical areas for decades. This way, Hospital Punta Pacifica gave a step forward in the region, since it’s the first on Latin America and the Caribbean to be affiliated to Johns Hopkins Medicine International. The alliances generated between the hospital and the best specialty physicians of the country, as well as the joint efforts with public health entities, allowed the First Cardiac Transplant to be performed in 2016, placing the country in the world’s list of countries that make cardiac transplants. Hospital Punta Pacifica offers its modern facilities, which include 51 private rooms, 11 suites and 1 presidential suite, specially designed to offer an environment that call for relaxation to achieve a speedy and effective recovery. For the care of patients that require 24 hours of observation, it has 8 private intensive care rooms and 3 private rooms for semi-intensive care. In addition, it has a labor ward equipped with everything necessary to strengthen the mother-newborn relationship, including smart operating rooms which are adequate for procedures at different levels of complexity, such as outpatient, orthopedic, cardiac, thoracic, esthetic, bariatric and laparoscopic surgeries. The clinical laboratory is equipped to perform highly sophisticated tests, making it easier to get accurate diagnosis at the right moment. In the emergency department we are ready to care for any medical need the 24 hours of the day, 365 days a year, in case there are any medical emergencies. This ward has qualified staff and the protocols, procedures and technology necessary for a quick assessment and prompt treatment. The Radiology and Imaging department offers unique digital technology. Among these are the Digital Mammography device, Magnetic Resonance (MRI); Nuclear Medicine equipment for scintillography and the sophisticated 64-slice volumetric tomography that, in addition to being an excellent tool to detect heart failures, it has special settings for virtual fluoroscopy and colonoscopy. In addition, it has a bone densitometry equipment, used mainly to prevent common illnesses in women. Concerned for the health and well-being of the patient, Punta Pacifica Hospital’s medical services are aimed to optimize care and treatment times, guaranteeing a speedy and safe recovery. As guardian of the quality, safety and commitment with our patients, we put a service of excellence at your disposal, with specialized and professional care, including innovative technology that guarantees the comfort and satisfaction of our patients. The goal of Punta Pacifica Hospital and all the professionals that take care of the patient during the hospital stay is to offer quality, technical and human assistance. The purpose is to make sure the stay is as comfortable as possible. To achieve this, the hospital makes all of its resources available and guides its efforts for the patients’ quick recovery and autonomy, so they can return to their everyday life as soon as possible.